Stem cells from the patient’s own fat provide a gentle treatment option for joint problems due to age-related wear (osteoarthritis) or damaged joints after sports injuries. The treatment is suitable for knee joints, hip joints, as well as all other joints (e.g., joints of the fingers, shoulders, and spine). The transplantation of patient’s fat stem cells to the defective joint supports a natural healing mechanism and helps the body remedy the cause of joint problem itself. As a result, the body can regenerate joint damages to some degree. Joint patients can thus be spared a stressful surgery in general anesthesia or an artificial joint replacement. Body fat contains so-called mesenchymal stem cells and Stromal Vascular Fraction (SVF). 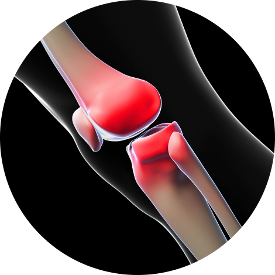 Worldwide, the regenerative potential of these fat stem cells for the treatment of joint problems such as osteoarthritis and cartilage damage is being investigated in clinical trials. Researchers found that patients suffering from damaged knees, hips, and other joints experienced an improvement in pain symptoms and mobility after treatment with their own fat stem cells. The treatment with the patient’s own fat stem cells is carried out as a single outpatient procedure in local anesthesia. First, a small amount of body fat is obtained by liposuction. Then the stem cells separated therefrom are injected into the affected joint. Thereafter, the patient can leave the office; a hospital stay is superfluous because of the gentle approach.